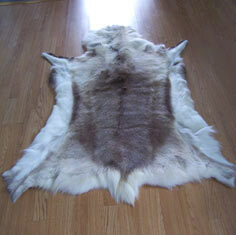 Reindeer skins can be used as rugs or wall decorations, alternatively they look great as a throw-over or seat covering. They can be used either inside or outside the home, each skin is unique with luxurious markings and ultra soft fur. The dense fur is a great heat insulator making them ideal for adding warmth to rooms including bedrooms and living rooms. Reindeer rugs originate from the Sami people, indigenous nomadic tribes travelling around the hills of northern Sweden, Norway and spreading to areas of Finland and even parts of Russia. Reindeer's are a way of survival for these people, they provide meat, milk and raw materials for clothes and tools.